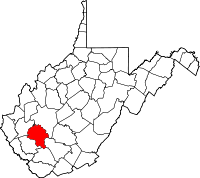 Boone County is a county located in the U.S. state of West Virginia. As of 2000, the population was 25,535. Its county seat is Madison6. Boone County was formed in 1847 from parts of Kanawha, Cabell, and Logan Counties and named for Daniel Boone, noted hunter and explorer, whose home was in the Great Kanawha Valley from 1789 to 1795. Boone County is part of the Charleston WV metropolitan area, with a 2004 population estimate of 307,763 people. Leading industries and chief agricultural products in Boone County include coal, lumber, natural gas, tobacco, and strawberries. On February 1, 2006, two fatal mining accidents occurred in the communities of Uneeda and Wharton in Boone County. These two deaths with the addition of January's Sago Mine disaster and the Aracoma Alma Mine disaster caused West Virginia Governor Joe Manchin to close all of West Virginia's mines in a "mine safety stand-down." According to the U.S. Census Bureau, the county has a total area of 1,303 km² (503 sq mi). 1,303 km² (503 sq mi) of it is land and 1 km² (0 sq mi) of it (0.04%) is water. As of the census² of 2000, there were 25,535 people, 10,291 households, and 7,460 families residing in the county. The population density was 20/km² (51/sq mi). There were 11,575 housing units at an average density of 9/km² (23/sq mi). The racial makeup of the county was 98.53% White, 0.65% Black or African American, 0.12% Native American, 0.07% Asian, 0.02% Pacific Islander, 0.07% from other races, and 0.54% from two or more races. 0.46% of the population were Hispanic or Latino of any race. There were 10,291 households out of which 31.10% had children under the age of 18 living with them, 57.50% were married couples living together, 10.50% had a female householder with no husband present, and 27.50% were non-families. 24.60% of all households were made up of individuals and 11.00% had someone living alone who was 65 years of age or older. The average household size was 2.47 and the average family size was 2.92. In the county, the population was spread out with 23.20% under the age of 18, 9.00% from 18 to 24, 28.00% from 25 to 44, 26.30% from 45 to 64, and 13.60% who were 65 years of age or older. The median age was 39 years. For every 100 females there were 95.50 males. For every 100 females age 18 and over, there were 92.50 males. The median income for a household in the county was $25,669, and the median income for a family was $31,999. Males had a median income of $34,931 versus $19,607 for females. The per capita income for the county was $14,453. About 18.30% of families and 22.00% of the population were below the poverty line, including 27.90% of those under age 18 and 13.90% of those age 65 or over. This page uses content from the English language Wikipedia. The original content was at Boone County, West Virginia. The list of authors can be seen in the page history. As with this Familypedia wiki, the content of Wikipedia is available under the Creative Commons License.